In this rhyming story, the latest in a series from Australia, Pig the pug celebrates Christmas in his characteristically greedy fashion. Pig’s best pal, Trevor the dachshund, asks Santa for “something nice” in a neatly printed letter shown on the front endpapers. But Pig has a Christmas list a mile long, ranging from a motorcycle to longer legs, reproduced in blocky print on the back endpapers. Wearing a red Santa suit, Pig stays up waiting for Santa’s arrival. When Santa leaves only a few presents, Pig yells at him rudely and tries to detain him by biting “poor old Santa’s big, rosy behind!” Pig doesn’t let go, and he is dragged along as Santa returns to his sleigh, with Pig complaining that his pile of presents “is just not enough.” (Sharp-eyed children may wonder how Pig talks when his teeth are clenched on Santa’s rear end.) The greedy pug finally falls from the flying sleigh, and in “a real Christmas miracle,” he is saved by landing on an angel at the top of an outdoor Christmas tree. The visual humor of the dog clamped onto Santa’s seat is funny (if a dog biting someone can be funny), but Pig’s greedy, ill-mannered comments to Santa are not. 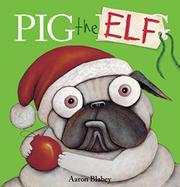 Mixed-media illustrations emphasize Pig’s bulging eyes, which are echoed in the similarly buggy eyes of Santa (who is white), his reindeer, and even Trevor the dachshund.